Help The Nyadire Connection get the bonus! For the past three years, TNC was awarded a special bonus for selling the most tickets to the Upper St. Clair/Bethel Park Rotary Club's annual Chicken Barbecue. The $500 bonus received in 2015 plus the club's donation allowed us to put $4,100 towards the fees for students in the outreach programs to take the critical O-Level exams and continue with their education. 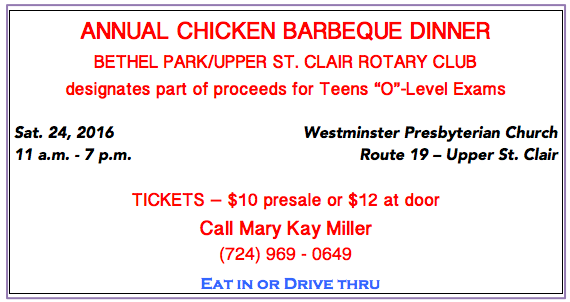 Help once more by buying a ticket(s) to the Chicken Barbecue on Saturday Sept. 24. BBQ is served from 11am - 7pm at Westminster Presbyterian Church. 100% of the profits go to many agencies. Dinner includes ½ barbequed chicken, coleslaw, baked beans, dinner rolls, dessert & drink and is served at the church or Drive–Thru. Presale tickets are $10 and are available by calling Mary Kay Miller at (724) 969-0649. Tickets at the door are $12.